Our boys will never turn down scrambled eggs, and they don’t seem to mind or notice when I finely grate some yellow squash or even zucchini in there. 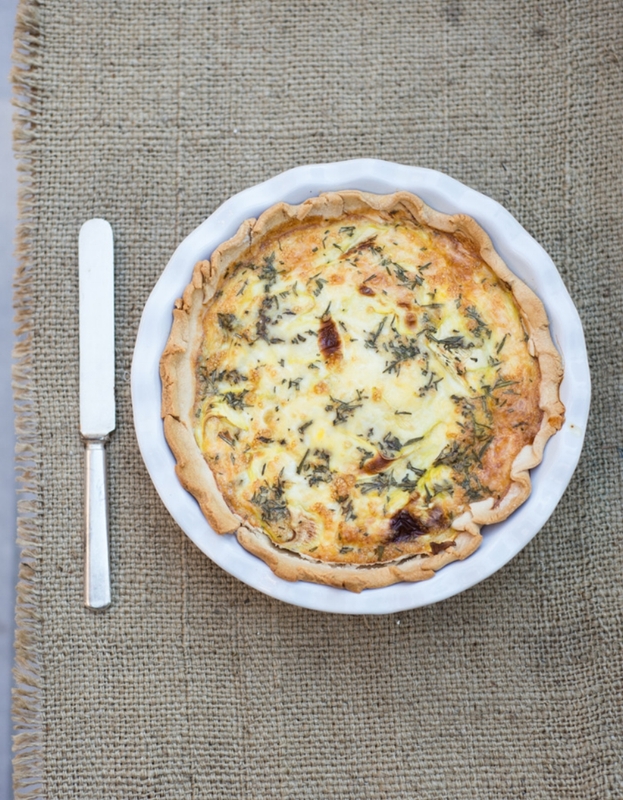 This week I’m going to try this quiche on them (minus the herbs probably). Anyone have favorite toddler-approved veg dishes?! Mix the eggs, cheese, milk and salt in a bowl and pour the mixture into a pie dish lined with pie crust. (I don't pre-bake the crust because I don't mind it occasionally doughy at the bottom, but you could if you don't mind the extra step and time.) Use a potato peeler to make ribbons from one small yellow squash and lay them all around in the egg mixture, pressing them down a bit under the egg. Sprinkle fresh thyme on top, plus more salt and pepper if you wish. Bake at 375F for 35-40 minutes or until set. Hope everyone had a fun Labor Day weekend! Guess what- we had a baby boy! Little Ezra has arrived and we couldn’t be more excited, grateful, happy or in awe! Now we are a forest family. As we enjoy these last days of summer, I thought I’d share a recipe that I did for the current issue of Remedy Quarterly, a fantastic foodie magazine that everyone should know about. 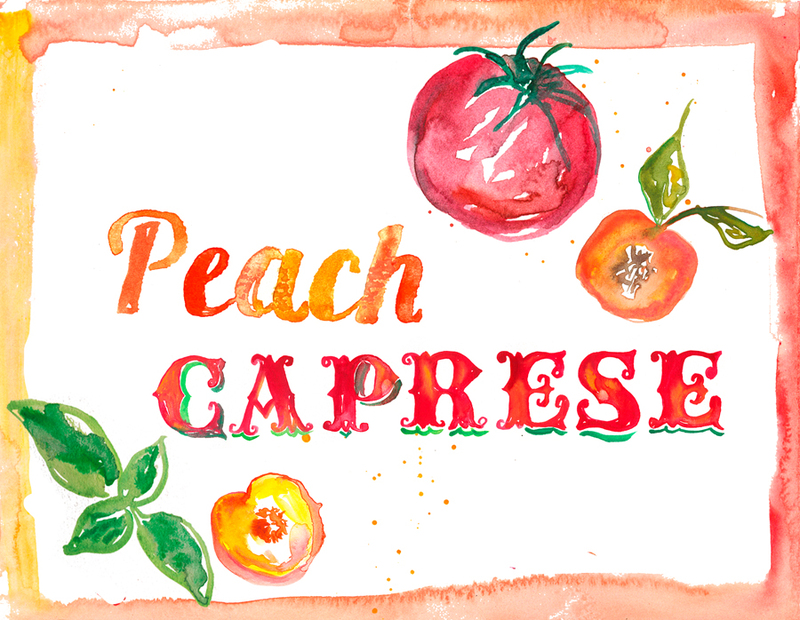 Here’s a simple summer twist on the classic Caprese salad: just add peaches! For the full post with more photos and details, click over to my post on the Better Homes & Gardens blog. 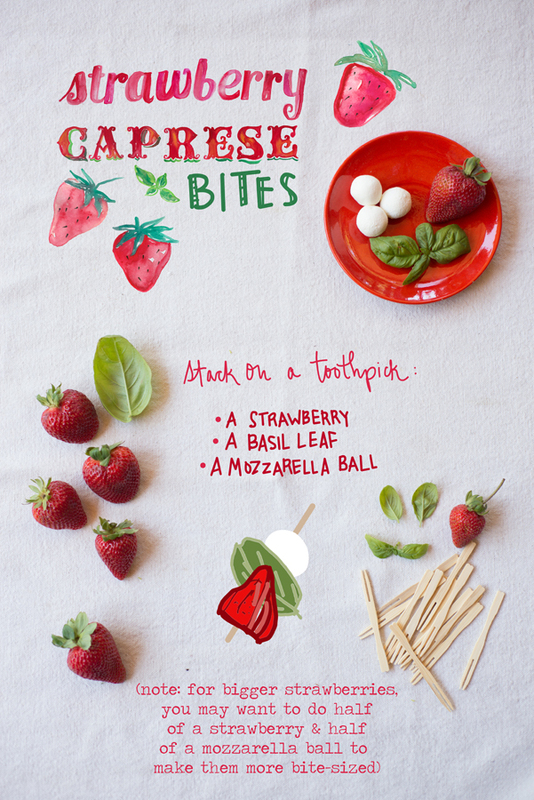 For an easy summer appetizer just stack a strawberry, a mozzarella ball and a leaf of basil on a toothpick! Like my Watermelon Feta Mint bites, they are great for BBQs and picnics as they can easily be made ahead. 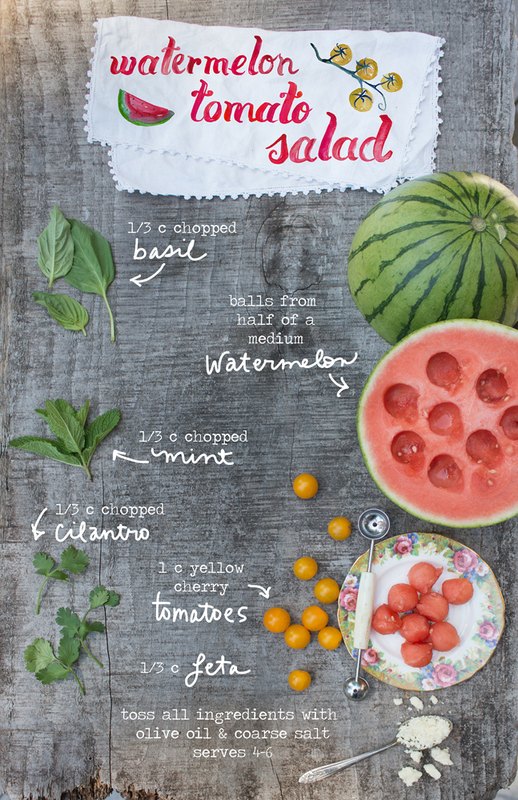 They were part of a summer entertaining menu I put together for InStyle magazine recently- see the whole menu here! 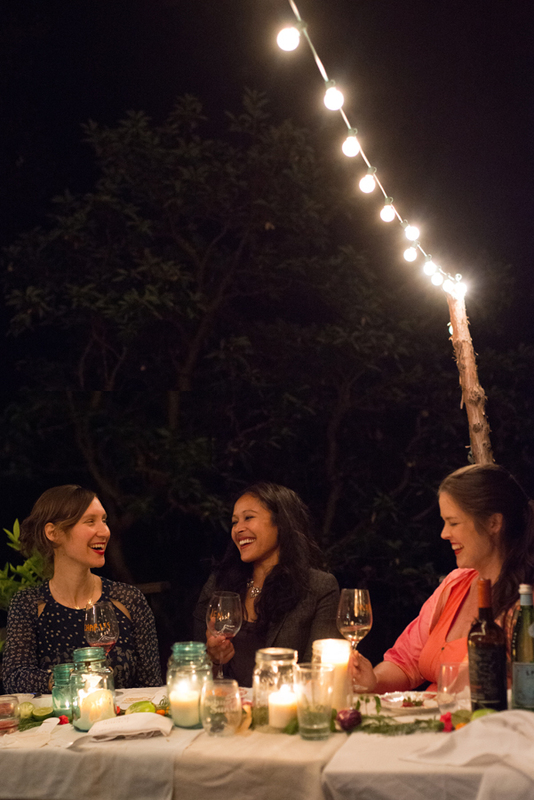 A couple weeks ago I hosted a dinner party that turned out to be one of my favorites, ever. The catch: I’d never met any of the guests before! Cooking a sit down dinner for 18 people at 8 months pregnant felt like quite a feat, but with lots of help, it turned out so well and I had so much fun! 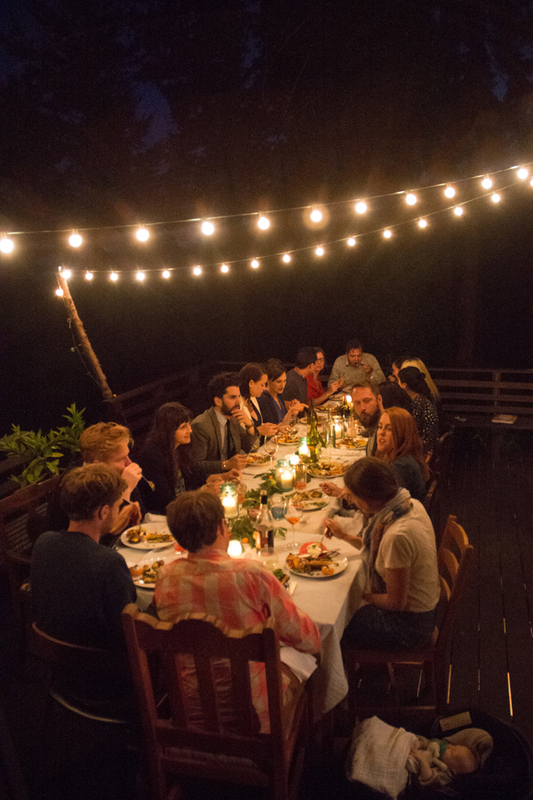 I hosted the dinner in collaboration with EatWith, a very cool website that helps people host or attend dinner parties in homes all over the world, and has a similar mission to The Forest Feast: to create community through food. EatWith asked me to invite people who I follow and admire online, but who I had never actually met in person. I curated what I think turned out to be an amazing group of creative people. We had a design blogger/stylist, a party/lifestyle blogger, a florist, an architect, a calligraphy artist, a painter, a chef, a maternity fashion maven, a cabin enthusiast, a food writer, a foodie marketing guru, a magazine editor/coworking space founder, and several more. Such an eclectic an inspiring bunch! I decorated one long table on the deck with greens I picked near the cabin plus lime halves, mini eggplants, kumquats, hot pink carnations and candles. I used a mish-mosh of plates and chairs that I’ve gathered over the years at flea markets. During the cocktail hour we had a spread of nuts, cheeses, fruit, crackers, olives, etc, plus my Guacamole Deviled Eggs, lots of chilled rose´ and a pitcher of Aperol Spritz. For dinner we prepared a buffet table full of summery vegetarian Forest Feast dishes from my cookbook that could be made ahead and served at room temperature: Watermelon Salad, Nectarine Tomato Salad, Kale Caesar with Polenta Croutons, Yellow Squash Galette with pesto, Polenta Stuffed Portabellos, Roasted Potato Salad with green beans. 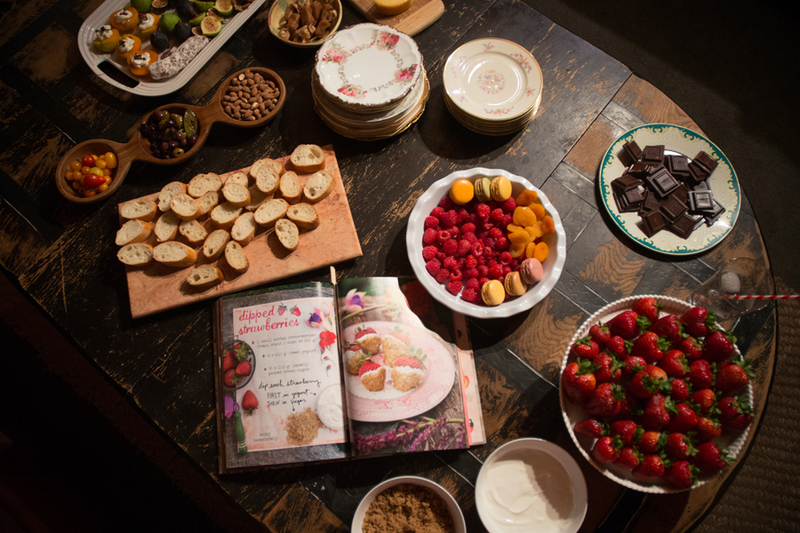 Dessert was a mix of chocolates, fruit, cheese, macaroons and Dipped Strawberries from my book. 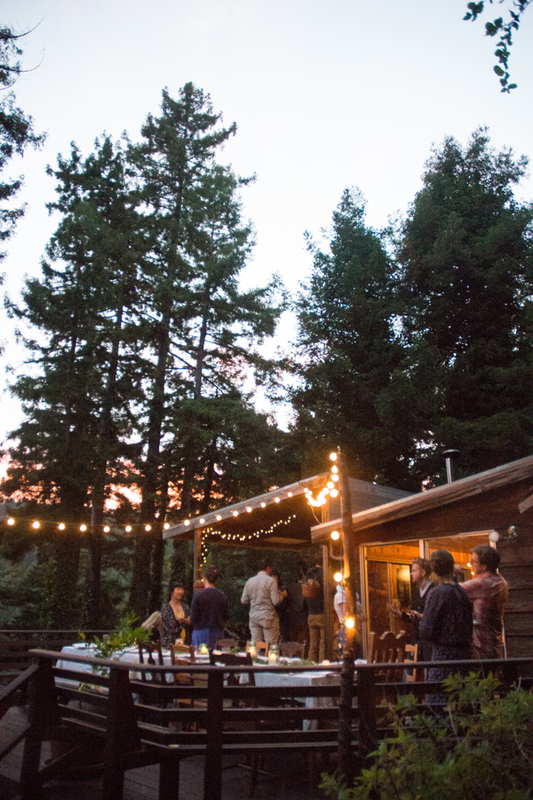 Thanks to EatWith for sponsoring this dinner and thanks to all the lovely guests who trekked out to the woods!